Discovery Park is the largest park in the city of Seattle—a treasure trove of green spaces, natural shoreline, and paved and rough trails alike. Whether you want to hike, enjoy a picnic or spend some time relaxing on a beach, this park has got you covered. With 534 acres to its name, it’s hard not to find something to do. While some parks are groomed and you might find blacktops or playgrounds, Discovery Park has a slightly wild appeal. 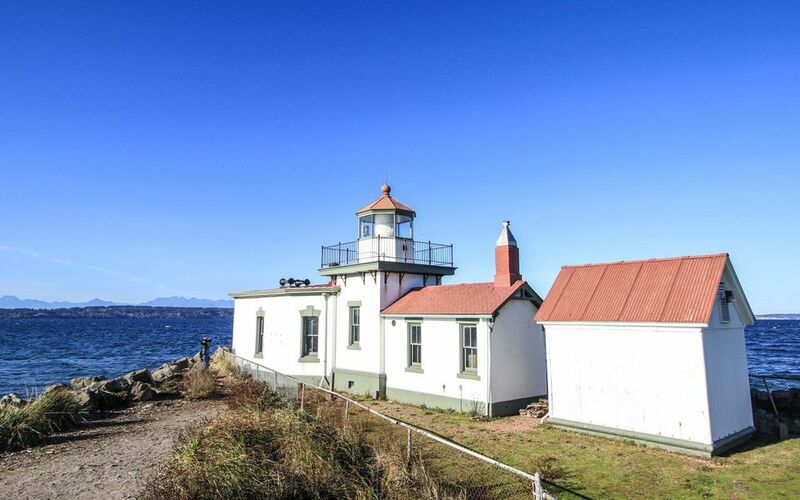 Sure, there are some paved trails and they are a great way to experience nature without having to put on your hiking boots, but you’ll find a lot of open meadows, cliffs overlooking the Puget Sound, wooded areas and a couple stretches of natural, rocky shoreline complete with a lighthouse. This is a place to enjoy the best of Western Washington’s natural side—views of Mt. Rainier and the Olympics, the Puget Sound and lush forests—without having to drive out of town or take on any major terrain. While life in Seattle is filled with crowds, tight spaces and traffic (so much traffic! ), Discovery Park offers respite from that. It’s not far at all from busy downtown, but it feels a world away. It’s easy to make your way to the park and explore without knowing anything about the grounds, but it just so happens that this park is planted on historic soil too—namely, the site of the former Fort Lawton. Fort Lawton was an army post located on the park grounds as well as in other parts of what is now the Magnolia neighborhood. The site was first given to the U.S. Army in 1898, and the 703-acre site was named Fort Lawton in 1900. While Fort Lawton had ample space for thousands of soldiers, it was not frequently well populated or used…at least not until World War II. During World War II, Fort Lawton became a major port of embarkation with up to 20,000 troops stationed there and more than 1 million passing through. More than 1,100 German POWs were kept here, and about 5,000 Italian POWs passed through on their way elsewhere. The fort remained active through the Korean War, but after that, things slowed down again and many of the World War II buildings were taken down. Even up until the past few decades, many fort buildings were still in the park, and Fort Lawton was not officially closed down until September 14, 2011. Today, there are still several former military buildings in the park, as well as a military cemetery. Discovery Park is situated on a square-ish shaped peninsula in the Magnolia neighborhood. There are parking lots throughout the park, but your best bets for finding the most parking are at the East and South parking lots near the entrances. The East Parking Lot is also nearest to the Visitor Center, if you prefer to grab a map before you explore. While the park is large, it's not so large that you'll need a map to find your car again (just remember which lot you parked at), but maps can be handy if you have a specific part of the park in mind and you haven't been here before. There are a number of trails through the park, but the Loop Trail is the main trail that takes hikers and walkers through the core of the park, with branches out to the perimeter. On the far side from the park entrance are beaches—the North Beach along one side, South Beach along the other, and West Point with the West Point Lighthouse at the tip of the park. At the park’s center is the Historic District, where you’ll find what remains of former Fort Lawton. The majority of visitors to Discovery Park come to wander with no particular agenda, and the park really is best that way. The trails in the park are one of the highlights, providing enough of a hike that you can get a bit of a workout (especially if you do the full Loop Trail as you’ll encounter some steps), or avoid the inclines if you prefer. The Loop Trail is just about 3 miles round trip and has a 140 foot elevation gain overall, and you’ll find signs marking how to get to the beaches, lighthouse and other trails. Many visitors also make a point to see the West Point Lighthouse, which is on the far side of the park. The lighthouse is not huge and towering, but instead quaint, cute and extremely picturesque against a backdrop of mountains and Puget Sound views. In fact, the beaches are the most beautiful spots in this overall beautiful park. On clear days, you’ll find top-notch views of Mt. Rainier and the Olympics, and on clear evenings, the beaches are some of the best spots in town to watch a sunset. Since Discovery Park is also one of the most natural spots in Seattle, wildlife still hangs out here pretty regularly. Seals and cranes like to spend time on the beaches (don’t expect too many on busy days, though). On the forested trails, you might see an owl or raccoons. You'll always spot plenty of birds. Because the park is also a historic spot, another option is to seek out the history that remains. The Historic District is located at the center of the park, and the military cemetery is close to the entrance off of 36th Avenue W. Going back even before Fort Lawton, the park belonged to native tribes. In honor of this history and the wider history of Native American tribes in and around Seattle, the park is home to the Daybreak Star Cultural Center—a 20-acre event space and conference center that not only hosts larger events and pow-wows, but also a preschool, family services programs, an art gallery and more. Visiting the cultural center is free (though, donations are appreciated) and it’s open from 9 to 5 on weekdays. The Discovery Park Environmental Learning Center is also on the park grounds, offering a preschool, camps and other educational opportunities. Discovery Park is located at 3801 Discovery Park Boulevard in Seattle’s Magnolia Neighborhood. There are entrances to the park along W Emerson Street and 36th Avenue W.
Park at many points throughout the park, but often the lots closer to the beaches don’t have as many spots. Park at the East Parking Lot near the Visitor’s Center and it’s about 1.5 to 2 miles to the beach.